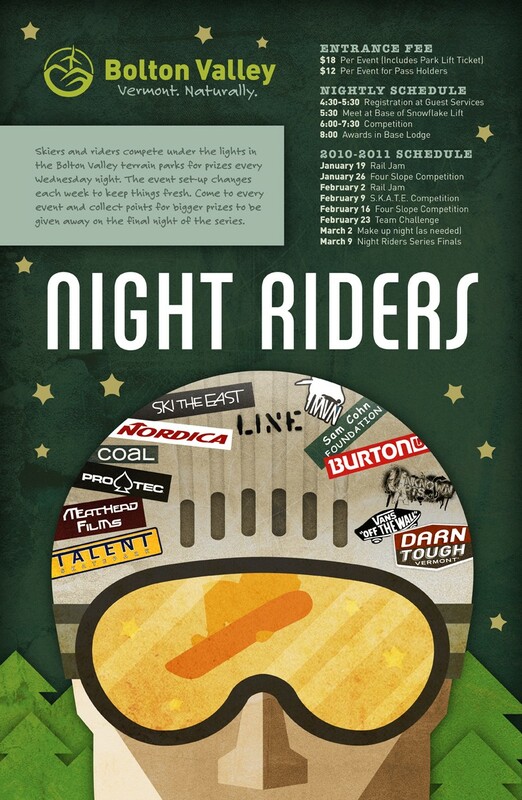 Skiers and riders compete under the lights in the Bolton Valley terrain parks for prizes every Wednesday night. The event set-up changes each week to keep things fresh--sometimes it's a rail jam, sometimes it's a full slopestyle, or it can be anything in between. Come to every event and collect points for bigger prizes to be given away on the final night of the series. Sponsors: Burton, Coal, Darn Tough, Line, Maven, Meat Head Films, Nordica, ProTec, Sam Cohn Foundation, Ski the East, Talent Skate Park, Unknown Arts, and Vans. $18 registration includes park lift ticket. $12 registration for pass holders.